NCERT 3rd class English book solutions are available in PDF format for free download. These ncert book chapter wise questions and answers are very helpful for CBSE board exam. CBSE recommends NCERT books and most of the questions in CBSE exam are asked from NCERT text books. Class 3 English chapter wise NCERT solution for English book for all the chapters can be downloaded from our website and myCBSEguide mobile app for free. to provide print-rich environment to relate oracy with literacy. to build on learners’ readiness for reading and writing. to promote learners’ conceptualization of printed texts in terms of headings, paragraphs and horizontal lines. to enrich learners’ vocabulary mainly through telling, retelling and reading aloud of stories/folktales in English. to use appropriate spoken and written language in meaningful contexts/situations. to give them an opportunity to listen to sounds/sound techniques and appreciate the rhythm and music of rhymes/sounds. to enable them to relate words (mainly in poems) with appropriate actions and thereby provide to derstanding of the language. to familiarize learners with the basic process of writing. focus on discussions, project works, activities that promote reading with comprehension depending on the level. Here is the list of topics covered under each chapter of class 3 English NCERT text book. NCERT Solutions Class 3 English PDF (Download) Free from myCBSEguide app and myCBSEguide website. Ncert solution class 3 English includes text book solutions. NCERT Solutions for CBSE Class 3 English have total 20 chapters. Class 3 English ncert Solutions in pdf for free Download are given in this website. 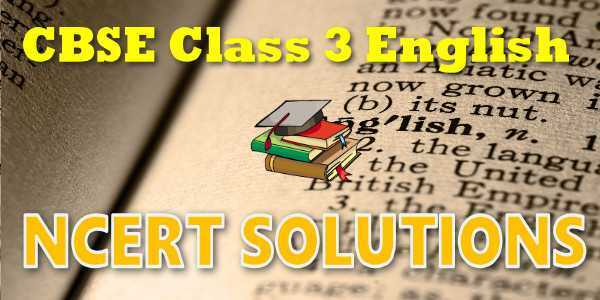 Ncert English class 3 solutions PDF and English ncert class 3 PDF solutions with latest modifications and as per the latest CBSE syllabus are only available in myCBSEguide.